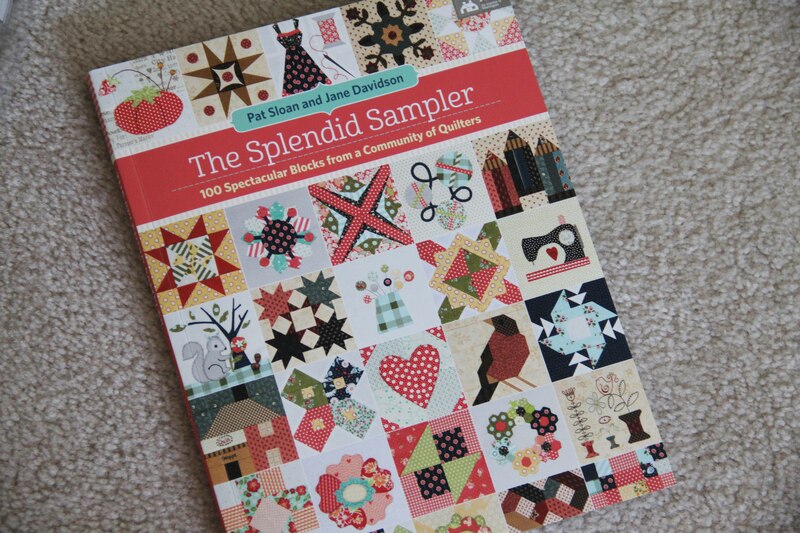 Are there any Splendid Sampler participants still out there? I know there are. We were in the neighborhood of 20,000 strong when we started last February. I know many of you are up to date and still participating…and many, many more of you, like me, are hanging on…barely. We knew when we started that this would be a long and unpredictable journey. A yearlong commitment to any project is risky, and in this one, we really had no idea what blocks would be thrown our way. My special thanks to all the designers who have donated their time and effort to these wonderful blocks. While I have deep respect for all of you, I may not sew out a few of your blocks. Please don’t be offended. Sometimes the stress of learning a new technique, combined with time constraints, just has me putting off a few blocks. Also, in fairness, If I had the same taste as all 75 or 80 designers, I wouldn’t have much of my own. So, every now and then, a block just isn’t my thing. That’s OK. I still appreciate the work, and I probably would take the time to do them under different circumstances. But, hey, it’s my quilt, and at the end of the day, I reserve the right to be a little choosy. 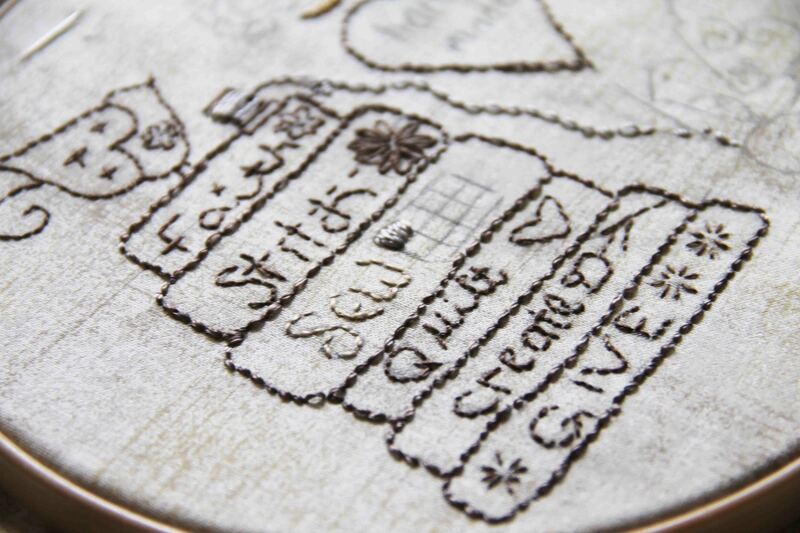 That said, I have ventured into many an area I never thought I’d enjoy–like hand embroidery. 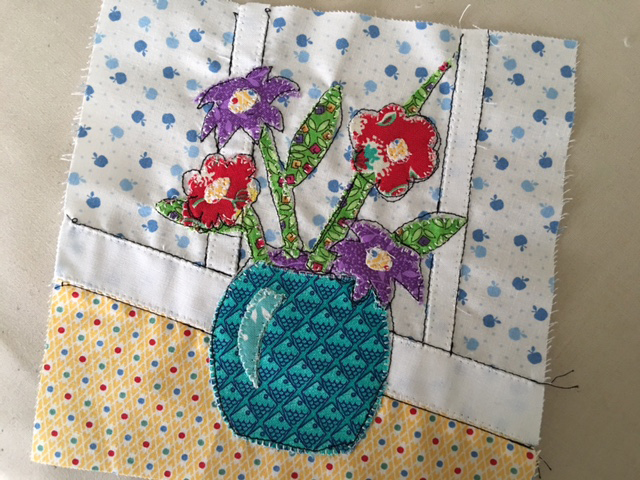 Believe me, I still fall back on machine embroidery when I fall behind…or when I don’t really want to do any applique. Then I just digitize the whole block. 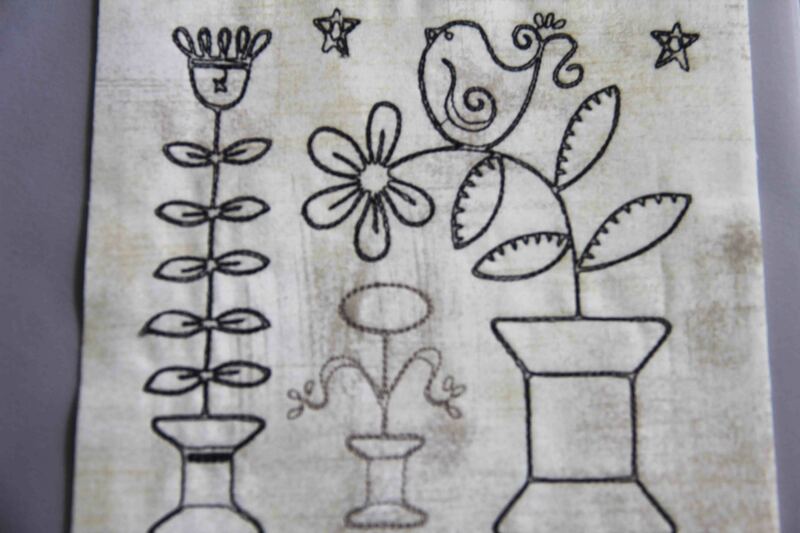 But a few of them I’ve done by hand, and while time-consuming, they have that unmistakable “slow stitched” look. 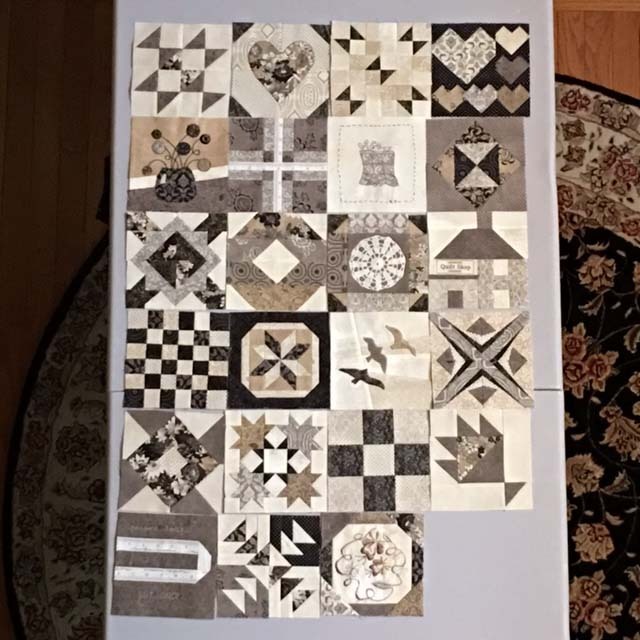 No matter how you look at it, I am still proud that at the end of this year or the beginning of the next, I will have an amazing, interesting, unique and lovely quilt all pieced and ready to be assembled. 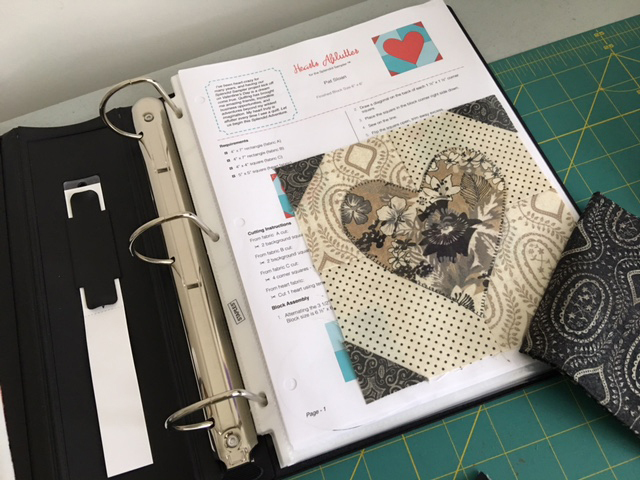 It will be both a tribute to fellow quilters and a learning process on my part. In this picture, I left the blocks in their cellophane sleeves so they don’t begin to fray from too much handling. Now back to the business of filling in some of the blocks I missed along the way. If you are inclined to join, feel free to hop on board. You can find the block patterns and all you need to know right here. The Splendid Sampler Facebook page is also a great place for inspiration and community–see everyone else’s projects! Keep going Splendid Sampler lovers…we’ve rounded the corner! Since this project goes on for 100 blocks, I thought I would give an update every 10 blocks or so. For now at least, I am really looking forward to every block, searching for the time to make it before the next block rolls out. (New blocks come out every Sunday and Thursday). Even more than that, I am enjoying seeing all the other work that others are creating, on the Splendid Sampler Facebook page. 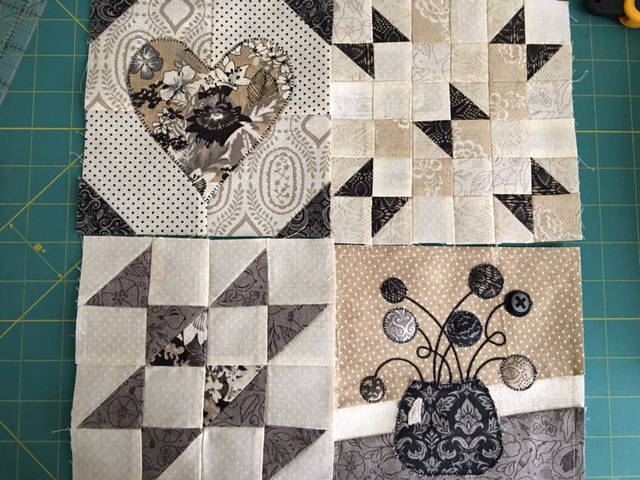 Here is a look at my blocks so far. 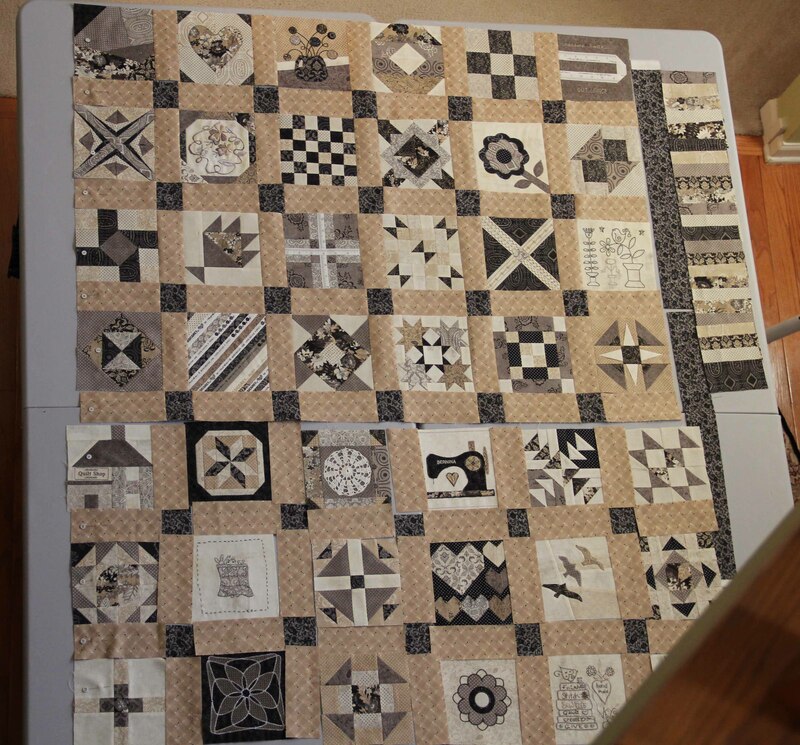 This grouping includes one of the bonus blocks which I did before the group even started. 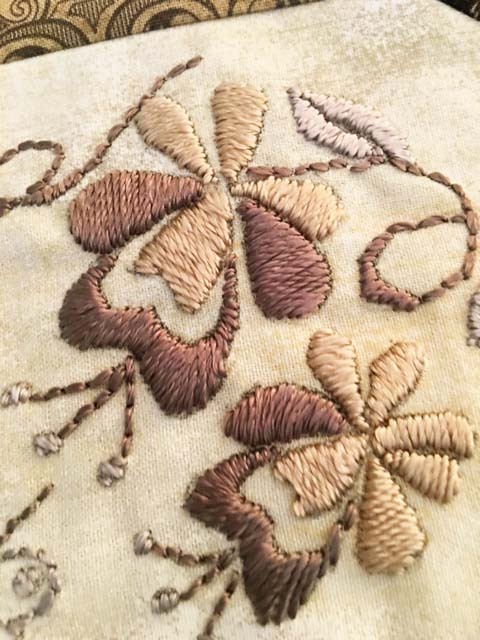 They include everything from hand embroidery to digitizing and machine embroidery, as well as needle-turned applique and raw edge applique. 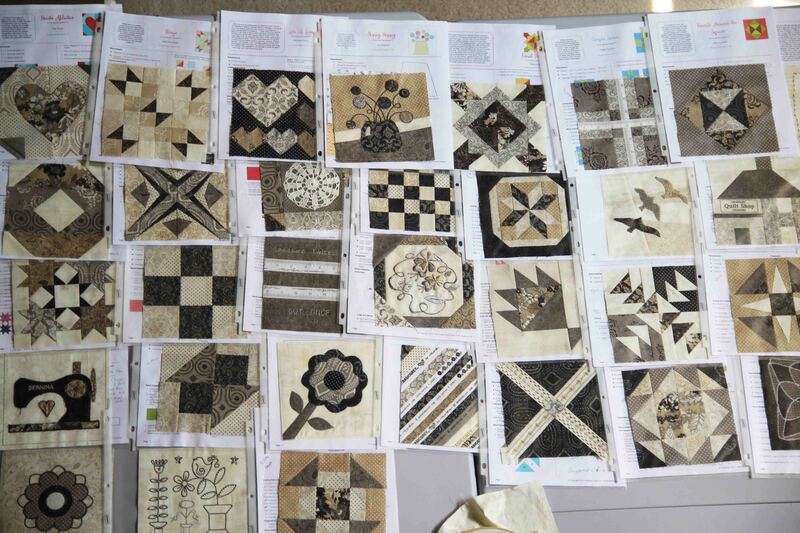 I have not done any paper piecing, though some of the blocks have made that available. I am holding out for a slightly more complicated block…one that would be more difficult to piece traditionally than to paper piece. 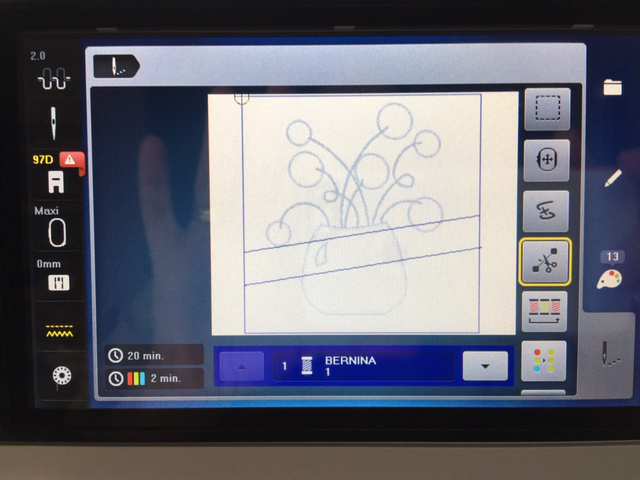 Maybe a little flower or something like that. With 90 or so blocks to go, I’m sure something will come along! Luckily, I’m still finding time to do some of my own work as well, which I will share in an upcoming post. I’m really into neutrals these days, with a pop of color, so I see a theme emerging. A peak at my next project. Why am I participating in this project? 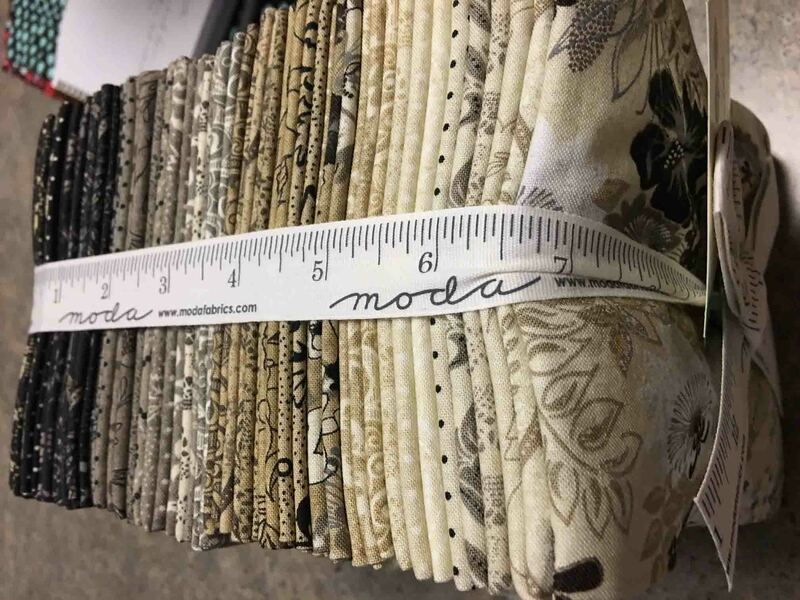 Partly, I think, because I like the designers who are contributing, partly because it sounds like a great way to slowly put together a quilt and share ideas with others. 6 1/2 inch blocks sound doable to me. Even 2 a week. 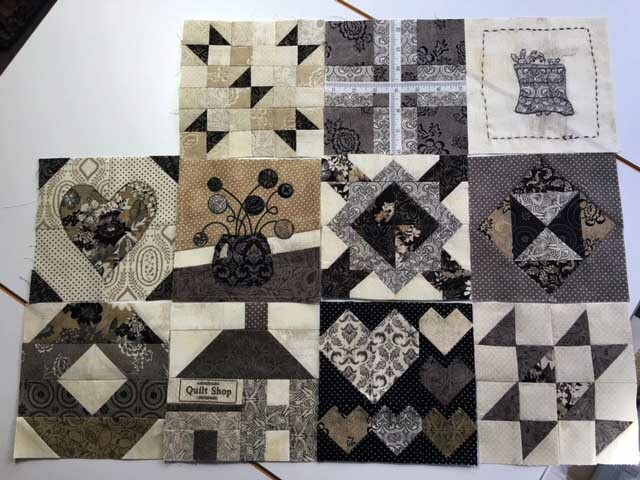 But if you were to tell me I need to create 100 blocks and do this sort of “surprise” mystery quilt, I might not have signed on. But 2 blocks a week sounds like a doable discipline. Care to join me? Here are the details for anyone who wants to participate. Also, here’s a link to the blog. The project begins Feb 14, so you have plenty of time to get ready. 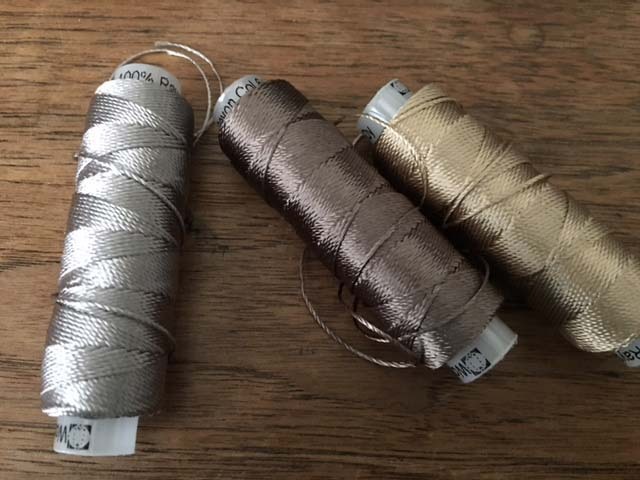 Although all you really need in order to start is a decent stash of fabric. I am going back and forth about which color scheme to use. I love the neutrals. 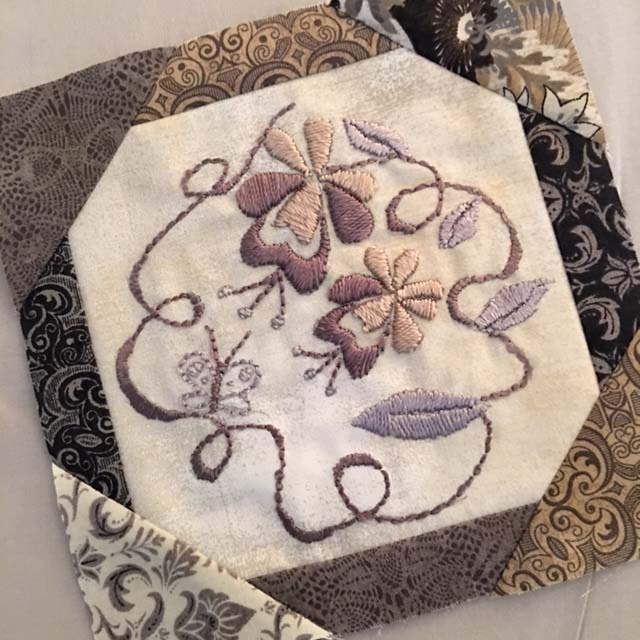 They would make an elegant and timeless quilt. 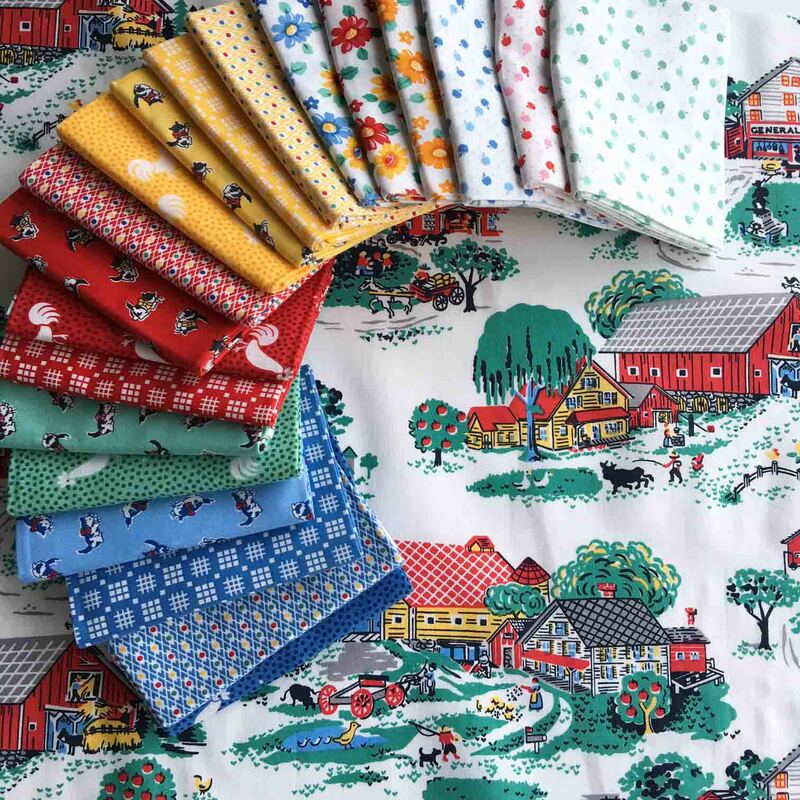 But another part of me wants to use more colorful fabric and go with more of a “farmgirl” theme. 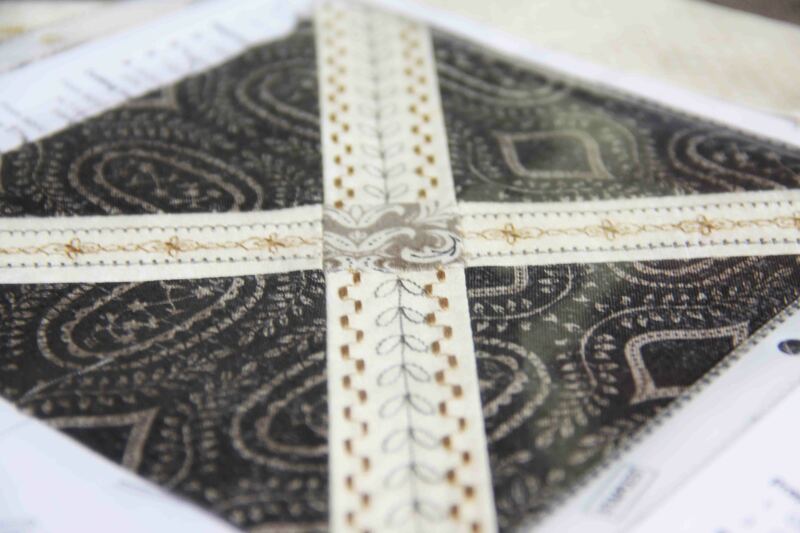 Here I would use the scenic fabric as a border with all the other fabric as the piecing in the middle. What do you think? They are both so different. I will probably wait til the block patterns start coming in to make a decision. 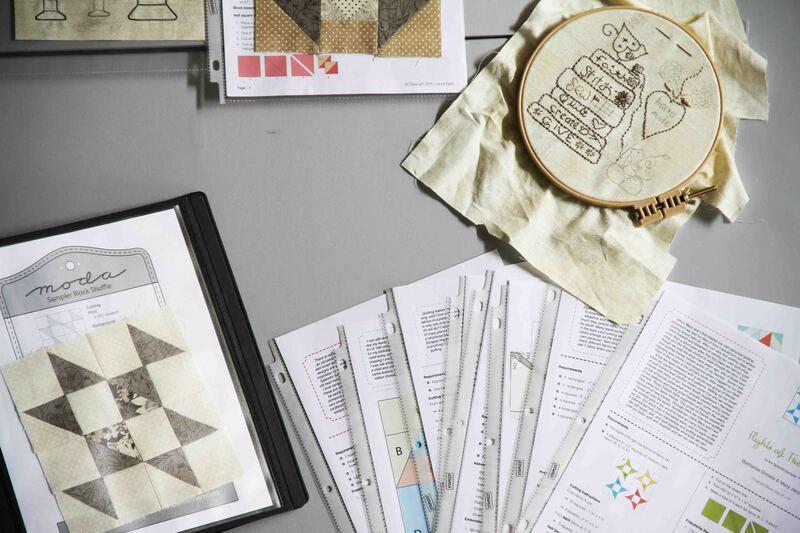 Dust off your sewing machine, and get ready to join in this creative collaboration. The project will have a Facebook page too, The Splendid Sampler, moderated by Pat Sloan. I’m sure you’ll have access to plenty of online show and tell, so why not be a part of it? All the patterns will be available throughout all of 2016 for free, but then they will be put into a book in 2017. 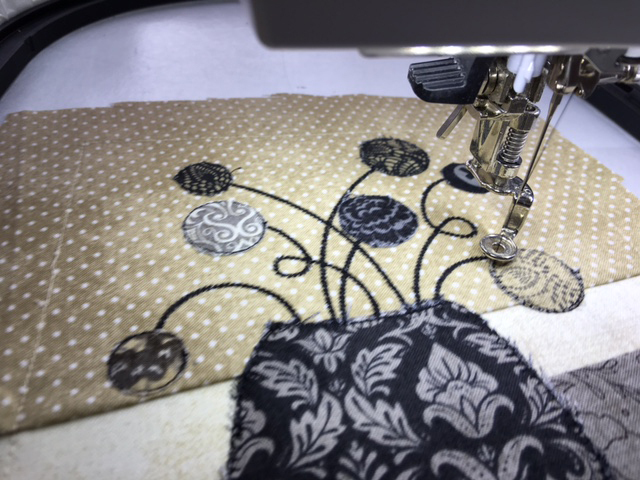 Even if you never sew a stitch, it’s fun to watch the process. What are you waiting for?